Today in Tbilisi, the Georgian women's team, which recently won the world team championship, were greeted by their country's Prime Minister, Irakly Garibashvili. It should be said that Georgia does not have a "political rank", and that the PM wields great power, along with the President. This was a meeting at the very highest level. The young head of government (Garibashvili is just 33) thanked the heroines on behalf of the country. "We are proud to have such talented girls. The whole world has learnt that once again". Separately, Garibashvili congratulated Nino Batsiashvili on winning the silver medal in the European Women's Championship. All the girls were presented with flowers and souvenir chess sets, and in return, the ladies presented the PM with a champions T-shirt. Also at the meeting were Georgian chess federation president, Gia Giorgadze, ECU head Zurab Azmaiparashvili, Nona Gaprindashvili and the new minister of sport, Tariel Khechikashvili. Tbilisi international airport, awaiting the world champions. The indicator boards show that the flight from Doha is on time. In total, the journey from Chengdu, with all the stops and transfers, has taken the players 24 hours. 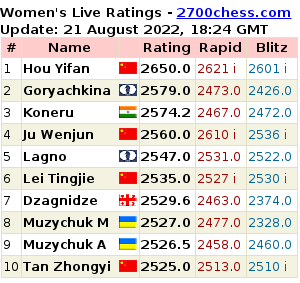 The 71st women's chess chmapionship starts in Tbilisi. 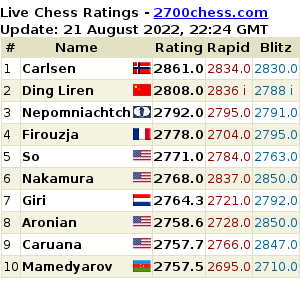 12 players will determine the strongest: Bela Khotenashvili, Nino Khurtsidze, Lela Javakhishvili, Nino Batsiashvili, Sofiko Guramishvili, Meri Arabidze, Sofio Gvetadze, Inga Khurtsilava, Sofiko Nikoladze, Ana Kuchava, Nani Unapkoshvili and Nino Khomeriki. Round 1 starts tomorrow at 12:00 CET. The drawing was held today at the Chess Palace. At the today's press conference in Batumi, the President of the Association of the Chess Professionals Emil Sutovsky announced that FIDE delegated its rights to the Association for the organisation of the Women's Rapid and Blitz World Championships next year.